Alden called me last night just in time to inform me to turn on the news and catch a short feature on sculptor Willard Wigan. Check him out. He's filthy rich now, as he should be. 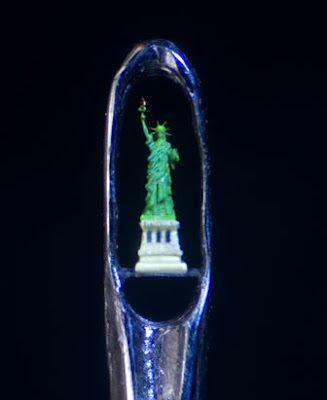 Yes, this is the head of a regular sewing needle. your next project needs to top this, no question. Wigan was inspired to do his work beginning at the age of 5. He is learning disabled, and doesn't know how to read or write, so as a child his teachers "made him feel small, made him feel like nothing." He decided to prove that "less is more," and that "nothing could be everything." Oh holy crap. I've seen this guy's work before and it makes my eyes cross just thinking about it. Amazing and stunning skill, here.